"The current estimate is that one in eight Americans suffers from alcohol dependence," said senior author Arpana Agrawal, Ph.D., a professor of psychiatry at Washington University School of Medicine in St. Louis. "And the gene we identified has a protective effect, but by no means is it the only thing affecting risk of alcohol dependence. We know environmental factors also play a role. We also think the genetic susceptibility to alcohol dependence stems from the small, cumulative effects of a very large number of variants across the genome." "As we analyze additional alcohol-dependent individuals, we should be able to find additional genomic regions affecting risk for alcohol dependence," said first author Raymond Walters, of the Broad Institute of MIT and Harvard. "We know there are other DNA regions that have small effects on risk, but it's going to take a large increase in our sample size before we can robustly identify those variants." "There were genetic links both to other psychiatric disorders, such as depression, and to use of cigarettes and other drugs like cannabis," said Joel Gelernter, MD, of Yale University School of Medicine. "As we study larger numbers of people, we expect to be able to determine at least to some extent how much of this correlation, or shared risk, is attributable to alcoholism, and how much may be the consequence of these other disorders." "There have been very large genetic studies of Europeans, but not as much research in African populations to try to understand what genetic factors underlie risk for alcoholism," said Howard J. Edenberg, Ph.D., of Indiana University School of Medicine. "In the future, we need to study much larger numbers of people from non-European populations because we don't know as much about genetic factors that affect their risk. As our study showed, these factors can differ from population to population." "People suffering from alcohol dependence generally drink a great deal, but they also experience other problems related to their drinking, like losing control over when and how much they drink," Agrawal explained. "I think it's likely that as the sample sizes of our studies increase, we may find new DNA variants related to these problematic aspects of alcohol dependence but possibly not related to typical drinking." "The risk conferred by the ADH1B gene is one of the strongest single-gene effects seen in people with a psychiatric illness, but overall, it explains only a small proportion of the risk," Agrawal said. 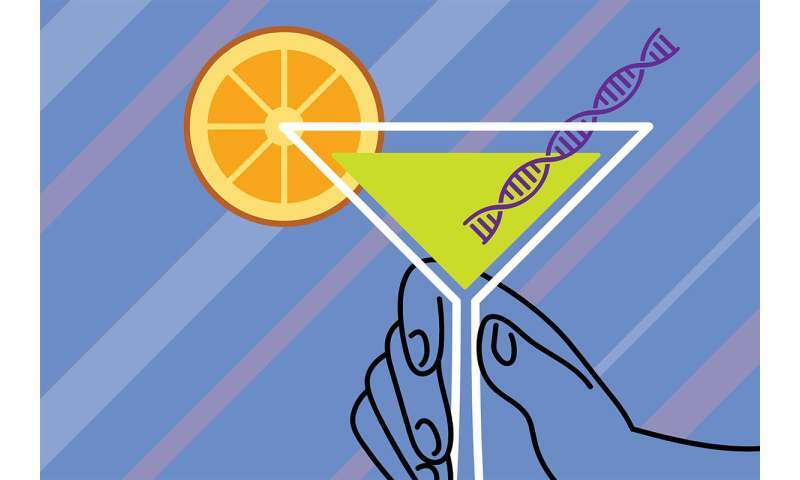 "Many additional gene variants are making small contributions to alcoholism risk, but to find them, we'll need to study more people."